Super Hero Boy: The best bath toy ever invented, as far as Connor's concerned! The best bath toy ever invented, as far as Connor's concerned! Connor takes baths almost to the point that its an obsession. One bad diaper, one accident, just the sound of running water, pretty much any excuse sends him running to the bathroom begging, pleading, doing anything in his little power to wrangle someone into turning on the water for him. Just forget taking a shower in this house without having an unexpected guest as he will get undressed and climb in unannounced and believe me this kid is not shy. I guess I shouldn't complain as he could be one of those boys who refuses to take baths and needs to be held down to be scrubbed. He actually does a superb job of bathing himself even down to his hair. His ears are really the only parts he needs help with. Don't worry if your showering with him he will kindly remind you as to which parts you've forgotten to bathe as well. The problem with this whole scenario is the fact that he prefers showers to baths but if he does take a bath he will try anything he can to get you to keep the water running. All of this while I listen to talk radio and hear about world water shortages and my son wants to keep the water running just so he can make pretend coffee and run my water bill sky high. I'm honestly not even sure where the "coffee" bit came from as well I don't drink coffee but I suspect that's something he learned from his Maw Maw. We've finally found a solution that keeps him happy without wasting water and it even comes with its own cups for whatever your little ones want to pretend. 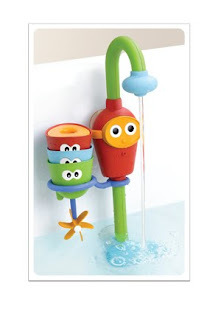 The YooKiddoo - Flow N Fill Spout was on the top of our list of toys to obtain the moment we saw the press release before it was even out on the market. It's actually a fairly simple bath toy, a spout attached to a little motor that pumps water from the bath out the top and comes with its own set of bath cups that rest in a cradle that can be moved back and forth. It runs off of batteries and I have to say they last a remarkably long time even with Connor using the toy several times a day and occasionally forgetting to turn it off when he is done. You turn the YooKiddoo - Flow N Fill Spout on by just pressing the face on the front, Connor figured this out in less than 30 seconds and its easy enough that even very little ones could easily accomplish it. The best feature about this bath toy is how wide spread the age range of children who would really appreciate it. It can easily run in just an few inches of water and it's safe and attractive to infants as young as 9 months (pretty much the moment they can sit up in the bath they will be able to play with this one) though even younger babies may enjoy the sound of running water in their bath and the bright colors as a distraction while you bath them. Connor nearing 3 years old and already declaring some toys too "babyish" shows no signs of loosing interest in his YooKiddoo - Flow N Fill Spout in fact our only regret is we didn't have it two years ago. It's been a bathing station for his boats and rubber duckies, a pretend coffee maker, and I've even caught him using it to rinse his hair off after we soap it up. Another small bonus if you use bubbles in your bath like we do on occasion it also helps keep the bubbles refreshed in the tub as it keeps the water circulating. I have a feeling we will wear out our YooKiddoo - Flow N Fill Spout long before we ever outgrow it around here and I'm fairly positive we paid off its $16.99 price tag the first month we had it just in saving on our water bill. You can pick up your own at the International Plaything's website. This is the coolest thing!! I love it as well as the other toys they have on their site! Thx so much for sharing! my youngest is 8 but he would also love this as well while taking a bath. He still loves baths even though he takes showers mostly now. & he also would climb in while one of us would be showering when he was younger! So funny! I think he would also like the boat w/ the stackables! Thx again for showing this off!